Orthodox Easter cuisine in Russia keeps pace with the liturgy’s potent symbols of resurrection, the triumph of light over darkness, and the return of spring. During Holy Week, Russians bake a light, dry traditional Easter bread, called kulich, and color and decorate hard-boiled eggs, which sadly fewer people these days seem to do in the traditional manner with the skin of yellow onions boiled in water. Orthodox Christians bring their eggs and kulich to their parish church for a Pascal blessing. Together with a sweet, rich, creamy curd cheese mold, spiked with spices, candied fruit, and citrus zest called paskha, these are the fundamentals of the Easter meal, right after the lengthy service, which culminates in the joyful Easter greeting “Xhristos Voskres!” or “The Lord Hath Risen!” to which the faithful respond, “He is Risen Indeed!” In Church Slavonic, this phrase is rendered by the Cyrillic letters “XB,” a motif which appears on eggs, kulich, and the paskha. I remember my first Russian Easter as a frantic hunt, not for eggs and chocolate, but for bake ware. Although I have a sizable arsenal of pots, pans, pie and tart dishes, and other baking paraphernalia, none of them is suitable for the Easter confections. I wanted to do the thing properly: kulich is tall and cylindrical with a slightly puffy mushroom-like cap on top. Paskha is traditionally prepared in a special trapezoidal mold called a pasochnitsa decorated with elaborate “XBs” and Orthodox Crosses on each panel so that the chilled mold retains the imprint of these seasonal decorations. In Russia, sourcing things never comes quite as easily as it does in the rest of the world. Figuring the pasochnitsa would be the harder of the two to run to ground, I started my search there. I prowled supermarkets and specialty kitchen stores to no avail. I checked the farmer’s markets and found nothing but got lucky with some local knowledge. Since the primary ingredients of paskha are cream, curd cheese, or “tvorog,” eggs, and butter, I threw myself on the mercy of the rosy-cheeked ladies who peddle these items at the market. “Try the Churches,” they advised, leaving me wondering why I hadn’t thought of that simple solution. I’d got the scent, and after a slight detour to the three churches in my neighborhood and the Danilovsky Monastery gift shop, I headed strait towards the source: the Sofrino Ecclesiastical Store in Central Moscow where you can buy anything and everything having to do with the Russian Orthodox Church from a slim 2 ruble candle to a 13 million ruble marble baptismal font. There was one pasochnitsa there and I held my breath as four priests cut in line in front of me (apparently they can) to stock up on holy water and wedding crowns, but I was in luck, and, precious pasochnitsa in hand, I literally skipped down the stairs and out into the. The kulich tin proved even more elusive. The church store didn’t have them. I trawled up and down the aisles of department stores and supermarkets. I found tube pans and charlotte moulds, both of which were too short, and baba cups, which were the right shape, but too small. Back at home, I burst into tears of frustration. “What’s wrong?” asked my Russian husband. Hiccupping slightly, I explained that, thanks to my lack of a kulich tin Easter would be ruined – completely ruined. To my surprise, he burst out laughing. He disappeared into the pantry, still chuckling, then emerged with four metal tins of various sizes, which held tomatoes, coffee, beans, and pickled mushrooms. “Kulich tins,” he said. I dried my eyes and let out a chuckle of my own. Paskha is the tangible proof that Lent has ended, combining, as it does, all the forbidden foods in one delicious confection. The smooth and rich creaminess of paskha is a perfect foil to the drier kulich, and one without the other doesn’t seem to make any sense. Don’t let the lack of a traditional pasochnitsa deter you from trying this recipe. An agnostic but serviceable mold of any kind will do the job. 1. Whip the egg yolks together until slightly thickened. Add the sugar and beat until smooth. 2. Cream the butter in a separate container and then add to the egg yolks and sugar. 3. Drain the curd cheese through a fine sieve, and then mix it well into the butter, sugar and egg yolk mixture until smooth. 4. Add the cream, vanilla and liqueur and mix until smooth. 5. Fold in one cup of the candied fruit and peel. 6. Line a mold with plastic wrap or cheesecloth. Pour the mixture into the mold, and then weight the top with a pot lid or flat plate and a heavy weight such. 7. Chill at least 12 hours in the refrigerator. 8. Unmold the paskha and decorate with the remainder of the candied fruit and peel. Keep cool until serving. 1. Butter aluminum tins, then line the bottom and sides with buttered parchment paper. 2. Combine yeast, 6 Table of water, 1 tsp of sugar and flour in a bowl. Cover and set to rise in a warm place with no breeze. 3. Beat the egg yolks and sugar together until combined, then vigorously for approximately 5 minutes. When the mixture is thoroughly combined, add the milk, then flour and the salt. Knead or mix for 2 minutes. 4. Add the proofed yeast, beating for 2 minutes to combine. 5. Add the melted butter gradually, beating a moderate speed. Let the dough rest for two minutes, and then test for elasticity. If needed, add more flour. 6. Add the egg whites and saffron and rum mixture. Once the dough is thoroughly combined, add one cup of the candied fruit. 7. Cover the dough to rise in a buttered bowl placed in a warm place until it has doubled in size (2-3 hours). 8. Knead the dough lightly a few times, then return it to the bowl and cover for another 2 hours. 9. Divide the dough between the aluminum tins so that the dough covers slightly more than ½ of the tin. Retain 1 cup of the dough. Cover and let rise another hour. 11. Take the retained dough and form it into strips. Place two strips across the top of the dough in each tin in the form of a cross. This will enhance the top of the kulich. 12. Glaze the tops of each tin and place in the preheated oven. Cook for 15-20 minutes. Then raise the temperature to 200°C. Smaller tins will cook faster than larger ones. Kulich is finished when a skewer inserted into it comes out clean. 13. The final step is a little local peasant wisdom that seems to work an extra bit of magic: cover a soft bed pillow with a towel and gently place the kulich tin onto its side on the pillow. Gently roll the tin back and forth over the pillow to east the kulich out of the buttered tin. Cool the kulich on its side on the pillow for at 40 minutes. Then place it upright and frost with the glaze of your choice. 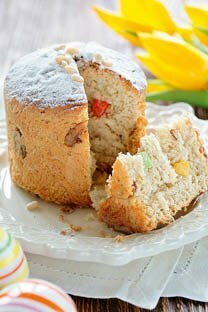 Use the remaining candied fruit and almonds to decorate the kulich in any way you wish!